Our pure soy healing candles are triple scented with pure essential oil blends to help you restore your equalibrium after a long day. Pure soy wax infused with calming Lavender, anti-depressant Sweet Orange & uplifting Peppermint essential oils and Jasper crystals for support in times of stress. Pure soy wax infused with positive mood reviving Grapefruit, tension relieving Cedar wood essential oils & motivating Citrine crystals. Hormonal Balancing Blend Pure soy wax infused with hormonal system balancing Rose Geranium, emotion calming & rejuvenating Bergamot essential oils & hormone harmonizing labradorite crystals. The jars may vary slightly depending on availability. It will come with a glass or a wooden lid. 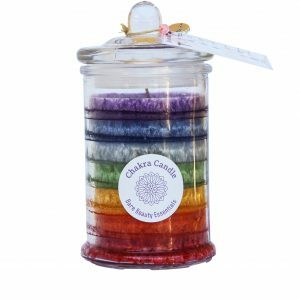 I purchased the Energizing Healing Candle, and it is just that, ENERGIZING! !